When I made my blocks for the lotto, I started thinking about making a quilt from these blocks in scrappy greens which led me to start thinking about the ways to make the block scrappy. The easiest, most straightforward approach would be to cut the background fabrics from different greens. You could also make it more scrappy by making the large 4 1/2 by 6 1/2-inch rectangles from two or more pieces. 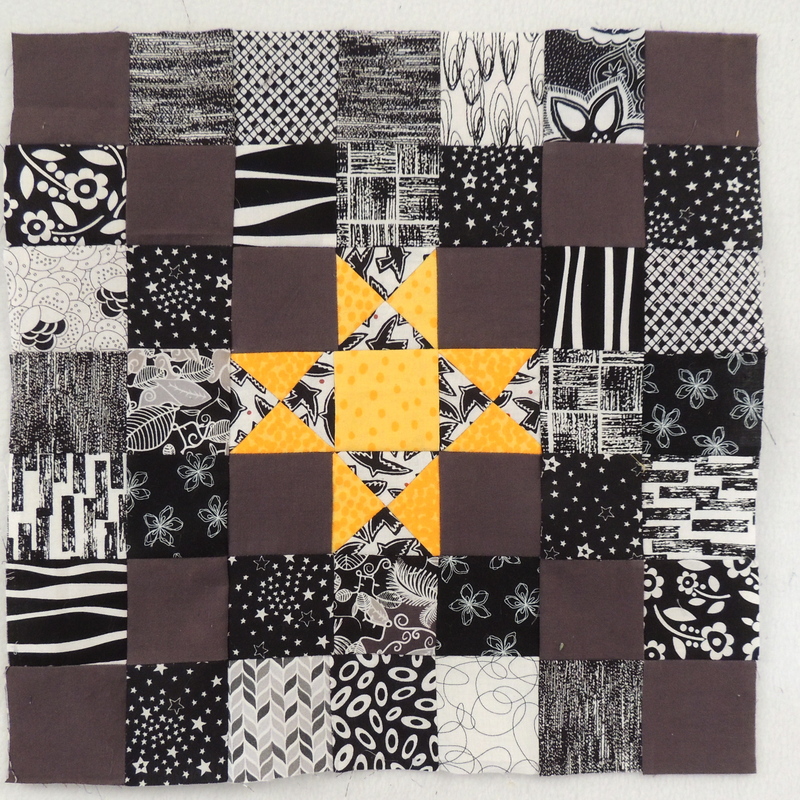 You could look at the block differently and assemble it as four 6-inch 9-patch units with a 2 inch pieced sashing (that includes the quarter-square units that form the star) and contrasting cornerstones (the center of the star). I have pulled a stack of green fabrics from my stash, but haven’t decided yet which approach I’ll use–there’s been lot of design indecision and paralysis from analysis happening at sophie junction. In the meantime, I happened to have a bunch of 2 inch squares which were cut for a border idea for a quilt project which, coincidentally also includes Star Chain blocks. I rejected the idea, but not before I had cut and sewn lots of these. Last night I was inspired to use them as the background in a couple of blocks. I could have made a better choice for the chain, but I’m going to leave it as is and use it as an opportunity to highlight it with quilting when I get to that point. I’m working on an idea for a project that could include any of the blocks from this year … I’ll be back as soon as I have tested it. 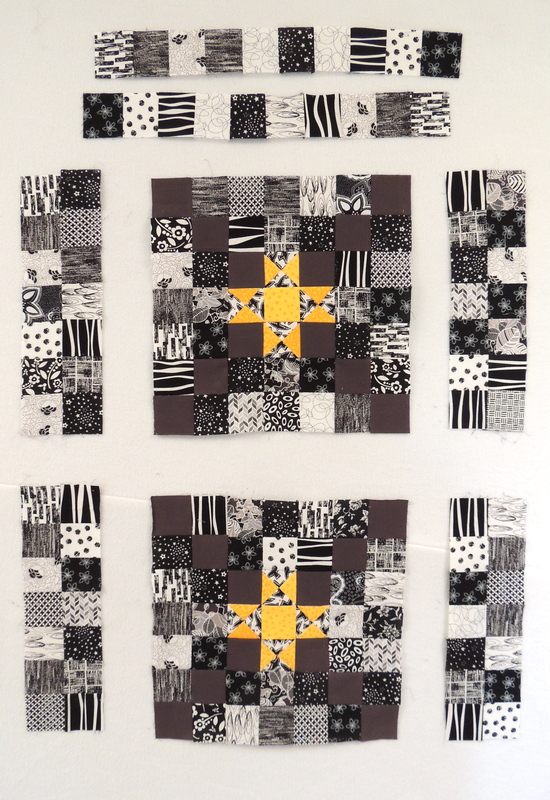 Here are the pieces I made from those squares. When I was done making these components, I had exactly ONE square left–it felt like it was meant to be. Sophie this is terrific! I just love scrappy!!! It’s turning out to be quite a versatile block. 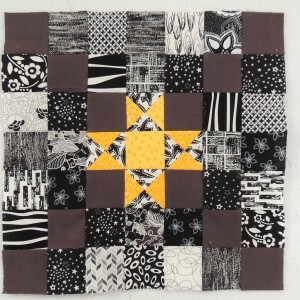 I like this one with the yellows, grays and blacks.